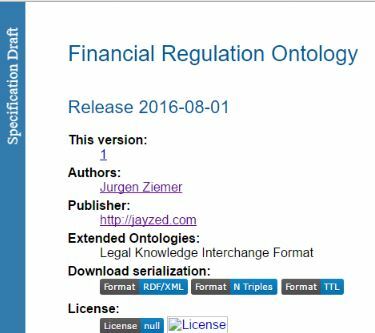 The Financial Regulation Ontologies (FRO) import the dominant Legal and Financial reference ontologies. FRO Users reported file not found import issues within FIBO, when opening Bank and Fund Ontology from URL in Protégé und other tools. The issues have been resolved and FRO loads without errors. The LKIF website, http://www.estrellaproject.org/ had been down for some weeks, disrupting OWL imports of the legal ontology. Thanks to the curator, the University of Amsterdam for restoring the server. FinRegOnt had used the Object Management Group (OMG) version of the FIBO. We reported FIBO FBC package inconsistencies issue to OMG half a year ago. The Enterprise Data Management Council (EDMC) just released a Major Technical Release to the FIBO standard. FinRegOnt and thus the operational Financial Regulation Ontologies switched from OMG to the latest EDMC Production version. We switched base URI for all FIBO ontology resources from http://www.omg.org/spec/EDMC-FIBO/ to https://spec.edmcouncil.org/fibo/ontology/master/latest/ (AboutFIBOProd.rdf). Online users of the Open Source Financial Regulation Ontologies should simply reopen the Bank, Fund or Hedge Fund ontology. Licensed users should obtain a new zip package of FRO for offline use and development.